Figure 1: The firing of a space thruster that is being studied at the Space Propulsion Laboratory at MIT firing. The bright exhaust is the plasma. Photo credit: Stephen Gildea. The main characteristic of a plasma is that a fraction of its particles is composed of free electrons (negatively charged) and ions (positively or negatively charged) such that the net charge is close to zero. Since charged particles can be accelerated by electric fields, the energy from the electric source can then be used to accelerate the charged particles or to promote collisions between particles. More specifically, an electron accelerated by an electric field may end up impacting one of the surrounding particles. Upon collision, the identity of the target particle can change. For example, when an electron collides with a neutral atom or molecule it may strip an electron away leaving a positive ion behind. Another possibility is that the target species may become excited (store part of the energy momentarily) and eventually emits this excess energy as a packet of light. Considering this, plasmas can be used either as a source of light and radiation in fluorescent lamps and plasma TVs or as a source of ions and other reactive species for sterilization and different fabrication processes. Additionally, the heat generated by collisions can heat plasmas to great temperatures allowing plasmas to be exploited for cutting and welding metal. Beyond these applications, plasmas have been used for more than 100 years for the propulsion of spacecraft and are used today on more than 230 space vehicles in Earth’s orbit as well as in lunar and interplanetary missions. For propulsion, the main property of plasmas that is exploited is the fact that charged species can be accelerated by electromagnetic fields. The way plasmas are used for propulsion in space is the same as for any other rocket engine; by reaction. It is the same principle that explains why a balloon flies around the room when the air inside escapes from it. Due to conservation of momentum, if the plasma (or gas) is expelled from a vehicle, the vehicle will accelerate in the opposite direction. Let us look at the propulsion process through one of the simplest types of electrical thrusters, the ion engine. The main elements of this engine are shown on Figure 2 (a nice animation explaining this process can also be found on the NASA website). Figure 2: Schematic diagram of an ion thruster. The main stages of the process are marked: Neutral gas injection (1), ionization chamber (2), acceleration of the positive ions (3), neutralization (4), and the plasma beam responsible for spacecraft propulsion by reaction (5). Neutral propellant is injected into a chamber (Stage 1) in which it is ionized. 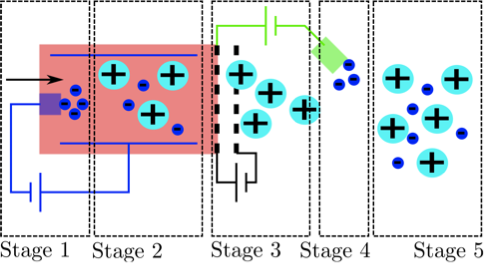 The ionization process can occur by different means, but a typical way is through electron bombardment: high-energy electrons are injected and some of the collisions end up ionizing the neutral atoms (Stage 2). After the ionization process, there are at least two perforated grids at different potentials that accelerate the positive ions out of the device and prevent the electrons from exiting (opposite charges are accelerated in opposed directions), thus creating a positive beam of ions coming out of the thruster (Stage 3). Since this arrangement would mean that the spacecraft would end up being charged negatively (positive ions leave whereas negative electrons are left behind), the excess electrons are collected and ejected to join the ions after the accelerating grid (Stage 4). This way, a mixed jet of positive ions and electrons (a plasma) comes out of the thruster and provides the propulsive force (Stage 5). Other types of electric propulsion devices use different acceleration systems but the concept remains the same: ionizing the neutral propellant to create ions, accelerating those ions in response to electromagnetic fields and injecting the excess electrons to avoid spacecraft charging. 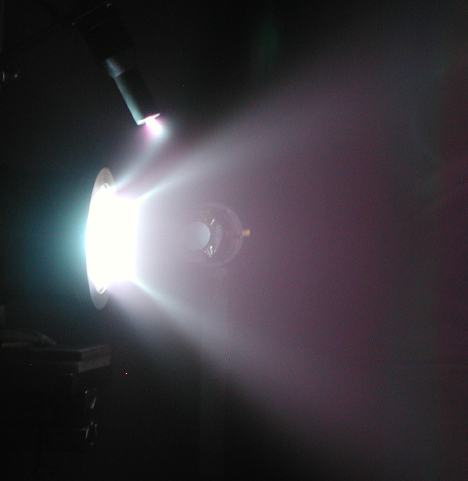 Figure 1 shows a photograph of a different type of thruster in the Space Propulsion Lab at MIT where you can see the beam of ions coming out and the electrons being injected shortly after. The main advantage of employing electric thrusters for space applications is the high efficiency of propellant use that they provide. They are characterized by a high specific impulse, which is the ratio of the thrust (useful propelling force) to the rate of fuel consumption. For chemical rockets, which rely on heating up a gas by a combustion reaction and expanding it out of the rocket, the limit is set by the amount of energy produced by the reaction. Electric thrusters can increase the specific impulse by a factor of 20, as the acceleration of the gas is produced by electric and magnetic forces. A simple parameter to characterize a given space mission is the so-called characteristic velocity increment or ‘delta-v’, which is a measure of the ‘push’ that is needed to change from an initial trajectory to another. For example, for a vehicle to escape the gravity of the Earth, the delta-v required is of 11.2km/s. This delta-v is achieved at the expense of consuming propellant and expelling it out. The delta-v can be shown to be proportional to the speed of the gas or plasma coming out of the engine. Therefore, missions that require high delta-v benefit from a high specific impulse. The high specific impulse generally means a slow rate of consumption of the fuel. Thus, ion engines operate more fuel efficiently but with lower forces and for longer times than chemical engines. For example, ion engines are limited to around 5N of thrust per squared-meter of exit area; note that this is roughly the weight of a mango fruit! The low thrust levels are not an inconvenience in space, where the force opposing motion is very small (there is basically nothing to push against!) but are far from enough to achieve certain purposes such as planetary takeoff and landing where gravity and drag have to be overcome and high-thrust engines are needed (chemical rockets). 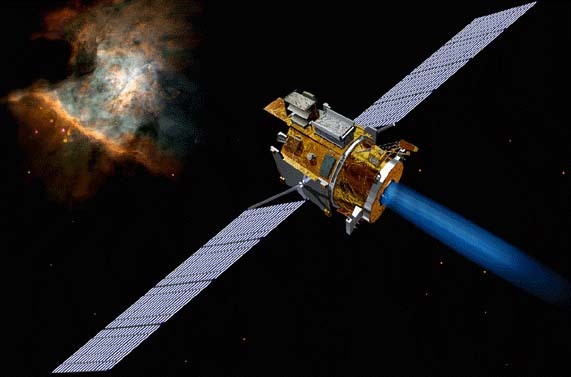 Therefore, with ion engines we are looking at space mission applications that are long-range, such as interplanetary flight, or those of long duration such as maintenance of satellite attitude. Figure 3: This image shows an artistic view of NASA’s Deep Space 1 probe with its ion engine firing. Photo credit: NASA. Although plasmas have been used for many years now for space propulsion applications, the field of electric propulsion is still a very active area of research, both at the fundamental and applied level. To-date, as stated in the 2012 NASA priorities report on In-Space Propulsion Technologies, the high priority technologies in this field are at the two ends of the spectrum: trying to increase the thrust levels using higher power (possible if nuclear systems are incorporated for power generation instead of commonly used solar panels) and micro-thrusters capable of providing very low thrust for precision maneuvering. Plasmas are propelling our spacecraft in space as we speak but there are still many places where they can take us! Carmen Guerra García is a 2009 fellow of the Fulbright Science & Technology program, from Spain, and a PhD candidate in the Department of Aeronautics and Astronautics at the Massachusetts Institute of Technology. ← Understanding the human brain: a work in progress or an impossible ambition?